Draw the base line of the given length. Next we bisect the base line. See bisecting a line if you are unsure on how to do this. Extend the bisector if necessary. 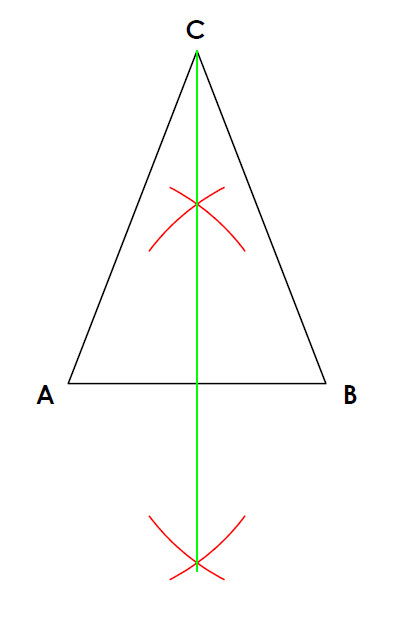 We bisect this because the apex of an isosceles triangle is always directly above the midpoint of the base line. Of course it can be anywhere along this line but we are also given the altitude. Step the altitude off along the bisector to give you point C. Join Point A to C and Point B to C, creating an isosceles triangle with the specified properties. Also this principle of construction will work regardless of the length of the base line you draw at the start.